Preempted Monday night by TEGNA8 in favor of the Dallas Cowboys-Arizona Cardinals simulcast, ABC’s The Good Doctor had its potential ratings amputated Tuesday in a buzzsaw 7 p.m. slot opposite a trio of established hits on rival networks. The return of CBS’ NCIS led the way as usual with 298,115 D-FW viewers, followed by NBC’s The Voice (269,031) and Fox’s Season 2 launch of Lethal Weapon (174,506). The Good Doctor’s delayed premiere lagged in fourth place with 159,964 viewers. In the advertiser-prized 18-to-49 age range, Good Doctor nipped Lethal Weapon for third place by a score of 35,278 viewers to 32,071. The Voice led with 89,799 viewers and NCIS had 48,107. At 8 p.m., the Season 2 premiere of NBC’s This Is Us won in both total viewers (334,471) and with 18-to-49-year-olds (166,769). Both were highs for the night. The 9 p.m. hour went to CBS’ NCIS: New Orleans in total viewers (276,301) and NBC’s first episode of Law & Order True Crime: The Menendez Murders in the 18-to-49 realm (64,142). NCIS: NO fell from first to fourth in this key demographic. On Fox Sports Southwest, the now officially eliminated Texas Rangers took a second straight pounding from the Houston Astros while just 36,356 total viewers endured it. TEGNA8 edged CBS11 for the most total viewers at 10 p.m. and in turn was edged by NBC5 among 25-to-54-year-olds (main advertiser target audience for news programming). Fox4 stayed solid at 6 a.m. with twin wins. At 6 p.m., CBS11 won in total viewers and NBC5 was tops with 25-to-54-year-olds. Fox4 and the Peacock tied for the most total viewers at 5 p.m., with NBC5 winning outright among 25-to-54-year-olds. The Dallas Cowboys played on two TV venues Monday night while angry D-FW fans of Dancing with the Stars predictably pounded TEGNA8 on its official Facebook page for sending the hoofers and puffers to obscure digital channel 8.2. 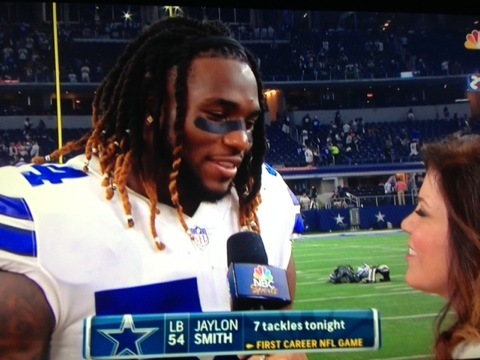 The Cowboys’ 28-17 road win over the Arizona Cardinals on ESPN’s Monday Night Football averaged 828,905 viewers for TEGNA8’s simulcast and 407,182 on the cable mothership. Hand calculator technology says that’s a grand total of 1,236,087 viewers for a game that stretched until 10:46 p.m.
Last year’s Game 3, a Cowboys-Chicago Bears matchup on NBC’s Sunday Night Football, drew a significantly larger crowd of 1,565,210 viewers. Some will say this is because of the NFL players’ protests against President Trump’s call to “fire” anyone who didn’t stand during the playing of the National Anthem. Throughout the league Sunday and Monday, some took a knee and others locked their arms in protest while standing. In the Cowboys’ case, players, coaches and owner Jerry Jones uniquely knelt and locked arms before the Anthem and then stood for its playing. Others might note that ratings for the Peacock’s Sunday Night Football typically are higher than for other Cowboys’ games. In any case, a difference of more than 300,000 viewers is notable. Among advertiser-coveted 18-to-49-year-olds, TEGNA8 had 314,296 viewers and ESPN, 102,627 for a total haul of 416,923. That’s way, way down from the 698,654 for last year’s Game 3. It’s also further evidence that the NFL increasingly is skewing older. Monday also marked the official launch of the new fall season, although ABC’s scheduled 9 p.m. premiere of The Good Doctor has been shuttled to 7 p.m. Tuesday on TEGNA8. Before the Cowboys and Cardinals fired up at 7:30 p.m., CBS’ 7 p.m. season premiere of The Big Bang Theory narrowly lost its time slot in total viewers with 407,182 while TEGNA8’s competing, locally produced Cowboys pre-game show had 414,453. In the 18-to-49 age range, Big Bang turned the tables and decisively won by a score of 189,219 viewers to 105,834. The first episode of CBS’ Big Bang spin-off, Young Sheldon, then performed solidly against the first half-hour of the Cowboys game, drawing 334,471 total viewers and 118,653 within the 18-to-49 motherlode. CBS’ 8:30 p.m. premiere of Me, Myself & I tailed off to 123,609 total viewers and 51,314 in the 18-to-49 demographic. That put it in third place among the Big Four broadcast networks, ahead of only the closing half-hour of Fox’s So You Think You Can Dance. NBC’s 9 p.m. premiere of The Brave managed 152,963 total viewers and 54,521 in the 18-to-49 realm. That put it in second place in both ratings measurements. Earlier Monday, the 9 a.m. launch of NBC’s Megyn Kelly Today had 58,169 total viewers and 16,036 in the 18-to-49 demographic. Although meager, those numbers were still good enough to twice beat Fox4’s syndicated Live with Kelly & Ryan. CBS’ double dose of Let’s Make a Deal was the 9 to 10 a.m. leader in both ratings measurements. NBC5 nipped CBS11 in total viewers at 10 p.m. in a downsized three-way race while CBS11 had the top spot to itself with 25-to-54-year-olds (main advertiser target audience for news programming). Fox4 again ran the table at 6 a.m. The 6 p.m. golds went to NBC5 in total viewers and Fox4 among 25-to-54-year-olds. At 5 p.m., Fox4 won in total viewers and NBC5 had the most 25-to-54-year-olds. D-FW’s CBS11 and its corporate parent, CBS Broadcasting Inc., discriminated against former early morning traffic anchor Tammy Dombeck because of her age, the U.S. Equal Employment Opportunity Commission claims in a lawsuit filed Tuesday against the station. 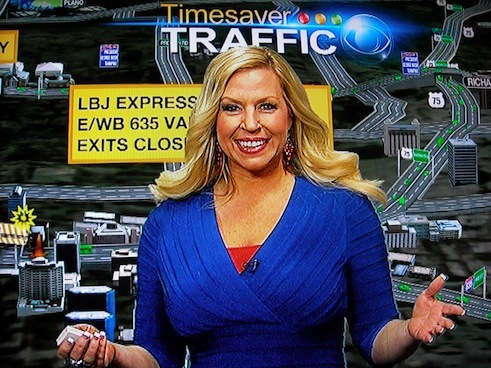 Dombeck Campbell, who was 42 at the time, ended up being a bridge between three younger blondes (one of whom eventually decided not to take the traffic anchor position) when CBS11 let her go in late April of 2015. She had become the station’s interim traffic anchor after Whitney Drolen resigned in October 2014. 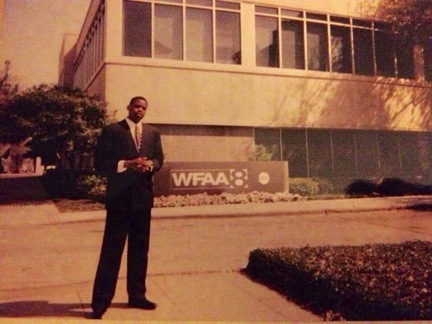 CBS11 had used Dombeck Campbell as a freelance fill-in traffic anchor during the 19 months before Drolen left. CBS11 instead first chose younger, blonde Amanda Zitzman as Drolen’s replacement, according to Dombeck Campbell and the EEOC attorneys. She had been the 2010 first runner-up to Miss Florida USA and now is an early morning reporter with Denver’s Fox31 station. “In the interim, though, they just kept bringing all these very young girls in to audition,” Dombeck Campbell said. CBS11’s long dormant early morning ratings were on a clear upswing at the time, particularly with the main news demographic of 25-to-54-year-olds. In the May 2015 ratings “sweeps,” the station ran third among 25-to-54-year-olds for the first time in its history. CBS11 since has fallen back to a distant last. Rather than keep the momentum going, CBS11 bypassed Dombeck Campbell a second time. Garber opted to hire the then 24-year-old Chelsey Davis, a former Arizona Cardinals cheerleader, as the station’s full-time traffic anchor. 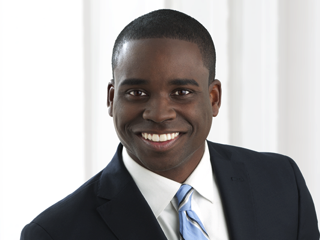 Davis, who also is a blonde, spent 16 months at CBS11 before leaving in October of last year to join her husband, former TEGNA8 early morning reporter Brandon Hamilton, in Phoenix. Davis’ replacement, Madison Adams, joined CBS11 in late December of last year and remains in place as the station’s early morning traffic anchor. For the record, the Fort Worth native and Baylor University graduate also is young, blonde, a former sports reporter and a two-time Miss Texas pageant entrant (in 2014-15) with no previous experience calling traffic signals. She became Madison Sawyer after her marriage in late August of this year. As required by law, the EEOC made an attempt to settle out of court with CBS11, Anderson said. “We attempted in good faith to conciliate it,” she said, but the two sides were far apart on an agreement “acceptable to the Commission.” They’ll now go to court unless a belated settlement is reached. Clark said that cases such as these typically are tried roughly eight months after a suit is filed. The EEOC has not disclosed what monetary compensation it’s seeking on Dombeck Campbell’s behalf. She recalls several of her CBS11 colleagues telling her it was “blatant age discrimination” to keep bypassing her for younger blondes with little experience. Absent a Dallas Cowboys game, Sunday’s D-FW ratings pacesetter turned out to be CBS’ featured late afternoon/early evening game between the Green Bay Packers (who won in overtime) and visiting Cincinnati Bengals. Broadcast booth rookie Tony Romo’s continued spot-on analysis was an added lure, with the game attracting 508,977 viewers and 211,689 in the advertiser-coveted 18-to-49 age range. NBC’s Sunday Night Football matchup, with the Washington Redskins dominating the visiting Oakland Raiders, finished close behind with 465,350 total viewers while tying Packers-Bengals with 211,689 viewers in the 18-to-49 motherlode. Sunday also brought the premiere of Star Trek: Discovery, which was delayed to 7:48 p.m. because of the football over-run. The lone free episode, on the CBS broadcast network, averaged 261,760 total viewers, but just 51,314 in the key 18-to-49 demographic. Discovery otherwise will be seen only on the network’s pay-per-month streaming site, CBS All Access. On Saturday, TCU’s decisive road win against favored Oklahoma State easily topped the college football parade with 269,031 total viewers on ESPN. The runner-up attraction, Fox’s prime-time Notre Dame-Michigan State clash, placed second with 109,067 viewers while ABC’s competing thriller, Penn State’s last-second win over Iowa, surprisingly averaged just 72,711 viewers. Friday’s prime-time pacesetter, NBC’s Dateline, had 130,880 total viewers and 41,692 in the 18-to-49 demographic. The competing, Austin-based Harvey Can[’t Mess With Texas relief special (from 9 to 10 p.m. on TEGNA8) drew 109,067 total viewers and 25,657 in the 18-to-49 age range. Participating celebrities included James Taylor, Paul Simon, Bonnie Raitt and Willie Nelson. NBC5 led in total viewers at 10 p.m. while TEGNA8 drew the most 25-to-54-year-olds (main advertiser target audience for news programming). Fox4 again swept the 6 a.m. competitions while the Peacock controlled the early evening with twin wins at both 5 and 6 p.m.
LOCAL TV PROGRAMMING NOTE: TEGNA8 has the over-the air simulcast of the Cowboys-Arizona Cardinals Monday Night Football game on ESPN. That will waylay the scheduled Monday, Sept. 25th premiere of ABC’s new The Good Doctor, which TEGNA8 will send to 7 p.m. Tuesday. As for Dancing with the Stars, it’s moving to the station’s 8.2 digital channel for a one-night stand. Good luck with that. The latest season’s final “performance” show put NBC’s America’s Got Talent firmly in charge of Tuesday’s prime-time Nielsens. Airing from 7 to 9 p.m., AGT drew 254,489 D-FW viewers while also ranking as the night’s biggest attraction among advertiser-prized 18-to-49-year-olds (70,556). Fox4’s local newscast, which is finishing off a very strong summer, then took over by comfortably winning at 9 p.m. in both total viewers (181,778) and with 18-to-49-year-olds (48,107). Here are Tuesday’s four-way local news derby results. TEGNA8 made its strongest across-the-board showing in a good long while, winning at 5, 6 and 10 p.m. in total viewers and among 25-to-54-year-olds (main advertiser target audience for news programming). The Big Four broadcast networks’ blanket telecast of Hand In Hand: A Benefit for Hurricane Relief drew TV’s largest aggregate audience Tuesday night. Airing from 7 to 8 p.m., the hastily arranged mini-telethon had a major contingent of show biz stars taking viewers’ calls. Among them were Barbra Streisand, Billy Crystal, George Clooney, Bryan Cranston, Cher, Jay Leno, Jon Stewart, Justin Bieber, Sofia Vergara, Adam Sandler and Julia Roberts. Others sent recorded messages, including Houston native Beyonce. NBC’s telecast drew the largest crowd of D-FW viewers, with 145,422. Following in order were CBS (101,795), Fox (94,524) and ABC (87,253). The Spanish language network Univision chipped in with 79,982 viewers, bringing the total to 508,976. A smattering of cable networks also carried Hand in Hand, but the ratings were negligible and in some cases “hashmarks” (no measurable audience). NBC followed with 283,573 viewers for its 8 to 10 p.m. edition of America’s Got Talent, which easily won those hours and also ran first with advertiser-coveted 18-to-49-year-olds (76,970). In Monday’s nighttime Nielsens, ESPN led the way with a Monday Night Football doubleheader. The opening game, Vikings and Saints, had 247,217 total viewers and 112,249 in the 18-to-49 age range. The Denver Broncos-San Diego Chargers matchup then drew 196,320 total viewers and 89,799 within the 18-to-49 realm. Over on Bravo, the latest episode of Real Housewives lured 28,357 total viewers in the 9 p.m. hour, with 13,470 of ‘em of the 18-to-49 persuasion. Monday -- TEGNA8 had it both ways at 10 p.m., winning in total viewers and 25-to-54-year-olds (main advertiser target audience for news programming). NBC5 won in total viewers at 6 a.m. while Fox4 was tops with 25-to-54-year-olds. Fox4 and NBC5 tied for first place in both ratings measurements at 5 p.m. The 6 p.m. golds went to TEGNA8 in total viewers and NBC5 with 25-to-54-year-olds. Tuesday -- Break out the cake and ice cream (and maybe even a little of the bubbly) at NBC5. The station accomplished an exceedingly rare double grand slam by sweeping the 6 a.m. and 5, 6 and 10 p.m. competitions in both ratings measurements. The closest contests were at 6 a.m., where the Peacock twice nipped Fox4. D-FW Nielsen ratings for the Dallas Cowboys’ opener, delayed two days by Hurricane Irma-induced technical problems, proved to be belated good news in the money ball arena. The numbers were significantly up from last year in both key viewer measurements. NBC’s national Sunday Night Football stage helps. Still, the Cowboys’ rather dull 19-3 home win over the punchless New York Giants was no match for both the excitement and disappointment of 2016’s last second 20-19 loss to the G-Men. This year’s opener, which whisked by in well under three hours, averaged 1,635,998 total viewers and 715,183 in the advertiser-prized 18-to-49-year-old demographic. Last year’s Game One, shown in the late afternoon/early evening on Fox, drew 1,444,810 total viewers and 600,207 in the 18-to-49 realm. The 2015 Cowboys-Giants season-opener (which Dallas won 27-26 on NBC’s Sunday Night Football), had 1,485,462 total viewers and 690,682 in the 18-to-49 age range. Apples-to-apples, the bigger numbers for this year’s prime-time NBC game (compared to 2015’s) are a very nice boost for the bean-counters at NBC5 and for Cowboys’ owner Jerry Jones. The Cowboys game also obliterated ABC’s competing 8 to 10 p.m. Miss America Pageant, which was barely noticed with 101,795 total viewers and 25,657 in the 18-to-49 motherlode. Earlier Sunday, Fox’s Green Bay Packers-Seattle Seahawks matchup, won 17-9 by the mighty Pack, ranked as Sunday’s runaway runner-up TV attraction with 676,212 total viewers and 272,604 of the 18-to-49 persuasion. Fox’s 7 p.m. premiere of The Orville, preceded by the network’s The OT, managed to pull in 239,946 total viewers and 96,213 in the 18-to-49 measurement. That was good enough to beat CBS’ opposing hour of Big Brother, which had 189,049 total viewers and 80,178 within the 18-to-49 demographic. Saturday’s college football parade was led by ABC’s marquee, prime-time Oklahoma-Ohio State game with 261,760 total viewers. TCU’s afternoon win over Arkansas on CBS ran second for the day with 196,320 total viewers. On Friday, Fox4’s 9 p.m. local newscast led all prime-time programming with 138,151 total viewers and 48,107 in the 18-to-49 age range. NBC5 won in total viewers at 10 p.m. while Fox4 ran first with 25-to-54-year-olds (main advertiser target audience for news programming). The two stations split the 6 a.m. golds in the same way. NBC5 swept the 6 p.m. competitions and added a 5 p.m. win in total viewers. Fox4 drew the most 25-to-54-year-olds at 5 p.m. The Kansas City Chiefs’ upset win over the defending Super Bowl champion New England Patriots added extra fuel to the D-FW ratings for Thursday night’s NFL regular season opener. Stretching until 11:17 p.m. on NBC, the smug, cocky Pats and their like-minded fans (in this view) were hit with a highly unexpected 42-27 home loss while 574,417 local viewers looked on. The crowd peaked at 610,772 viewers between 10:30 and 10:45 p.m. Among advertiser-coveted 18-to-49-year-olds, Chiefs-Pats averaged 237,325 viewers, topping out at 282,225 between 10 and 10:15 p.m.
CBS’ 8 p.m. hour of Big Brother, which usually leads Thursday’s prime-time fare in the 18-to-49-year-old demographic, came in a very distant second with 83,384 viewers. ABC ate gruel all night long with a last-place lineup among the Big Four broadcast networks of two Battle of the Network Stars episodes and The Gong Show. On Wednesday, NBC’s 7 p.m. edition of America’s Got Talent led all prime-time programming in total viewers (261,760) while Big Brother took the 18-to-49 crown (83,385 viewers). Also of note: Fox4’s 9 p.m. local newscast, which has performed strongly all summer, easily won its time slot in both total viewers (210,862) and with 18-to-49-year-olds (51,314). Wednesday -- Fox4 swept the 10 p.m. and 6 a.m. competitions in total viewers and 25-to-54-year-olds (main advertiser target audience for news programming). TEGNA8 likewise ran the table at 6 p.m. NBC5 had the most total viewers at 5 p.m. and shared the 25-to-54 lead with Fox4. Thursday -- In a downsized 10 p.m. race (NBC5 was overrun by football), TEGNA8 led in total viewers while Fox4 was tops with 25-to-54-year-olds. Fox4 drew the most total viewers at 6 a.m. but shared the spoils among 25-to-54-year-olds in a rare three-way tie with NBC5 and TEGNA8. Fox4 also won at 5 and 6 p.m. with 25-to-54-year-olds. NBC5 pulled in the most total viewers at 5 p.m. and TEGNA8 won the 6 p.m. gold in that measurement. Hello, CBS11, where are you? The station’s latest winless summertime drought remains in progress. Don’t blame the messenger. FX’s consistently most popular series, American Horror Story, launched for the seventh time Tuesday night with a Trump-bashing motif that played well in D-FW with advertiser-coveted 18-to-49-year-olds. Subtitled Cult, the 9 p.m. premiere won its time slot against all competing programming with 54,521 viewers in the 18-to-49 realm. That’s a very impressive percentage of AHS’s overall 79,982 viewers. A 10 p.m. repeat then drew an additional 22,450 viewers in the 18-to-49 age range. The latest self-standing version of AHS begins on election night, with a crazed, fear-mongering young Donald Trump supporter reveling in the shocking win while Democrats are horrified. A killer clown posse soon kicks in. Throughout Tuesday’s prime-time festivities, NBC’s 7 to 9 p.m. edition of America’s Got Talent racked up the most 18-to-49-year-olds with 76,970. The 9 p.m. debut of AHS: Cult ranked second for the night in this key demographic. But the 10 p.m. audience for AHS: Cult’s repeat enabled the show to match AGT overall among 18-to-49-year-olds. AGT otherwise also led Tuesday’s prime-time parade in total viewers with 305,386. TEGNA8 dominated at 10 p.m. with wins in both total viewers and 25-to-54-year-olds (main advertiser target audience for news programming). Fox4 swept the 6 a.m. competitions and added a 5 p.m. win among 25-to-54-year-olds. NBC5 scored with first-place finishes at 5 p.m. in total viewers and at 6 p.m. with 25-to-54-year-olds. TEGNA8 was tops in total viewers at 6 p.m.
Texas A&M got the Fox broadcasting network’s national stage Sunday night, and burned brightly while building a 34-point lead against UCLA. But then came Armageddon for Aggie-land, with the Bruins roaring back and winning 45-44 in the closing seconds of the fourth quarter. The game had the largest D-FW audience of any holiday weekend attraction, drawing 269,031 viewers. It was enough to outdraw CBS’ 7 p.m. episode of Big Brother, which had 239,946 total viewers but edged A&M-UCLA among advertiser-prized 18-to-49-year-olds by a score of 89,799 to 83,385 during their hour opposite one another. On Saturday, ABC’s prime-time showcase matchup between Alabama and Florida State ranked No. 1 with 218,133 total viewers. The network’s preceding game, Michigan vs. Florida at Jerry’s Palace, came in second for the day with 174,506 viewers while Texas’ home-opener flop against underdog Maryland ran third with 152,693 viewers on FS1. During Labor Day night, ESPN’s prime-time overtime game between victorious Tennessee and Georgia Tech clocked in with 109,067 total viewers. TEGNA8’s 10 p.m. local newscast, which aired opposite the OT portion of the game, easily outdrew it with a day’s best 189,049 viewers. Over on Bravo, the 9 p.m. fourth episode of Real Housewives of Dallas lured 34,174 total viewers. But a nice-sized percentage of them -- 25,336 viewers -- were in the key 18-to-49-year-olds demographic. Monday’s 9 p.m. leader, Fox4’s local newscast, had 152,693 total viewers and 48,107 in the 18-to-49 age range. Here are Friday’s local news derby results, with Monday “thrown out” because all four combatants took holiday exemptions. TEGNA8 ran first at 10 p.m. in total viewers while NBC5 took the top spot with 25-to-54-year-olds (main advertiser target audience for news programming). The 6 a.m. golds also were split, with the Peacock drawing the most total viewers and Fox4 prevailing among 25-to-54-year-olds. NBC5 swept the 6 p.m. competitions and added a 5 p.m. win in total viewers. Fox4 won with 25-to-54-year-olds at 5 p.m.
CBS’ Big Brother as usual led all Thursday prime-time attractions among advertiser-prized 18-to-49-year-olds, but Fox4’s 9 p.m. local newscast narrowly claimed the top spot in total D-FW viewers. Airing in the 8 p.m. hour, BB drew 86,592 viewers in the 18-to-49 age range, almost doubling the combined audience for competing “reality competition” shows on ABC, Fox and NBC. CBS’ annual summertime collection of sniping, posing “houseguests” also easily won its time slot in total viewers (181,778), but Fox4’s 9 p.m. news performed a bit better on that scorecard with 189,049 in likewise dominating the competition. CBS11’s 6 to 8 p.m. Dallas Cowboys telethon to benefit victims of Hurricane Harvey averaged 87,253 total viewers and 19,243 in the 18-to-49 realm. That was good enough to win from 7 to 8 p.m. in total viewers against competition from the other Big Four broadcast networks. Among 18-to-49-year-olds, the telethon ran a close third in that hour behind Fox’s Beat Shazam and NBC’s The Wall. Over on ESPN, the No. 2-ranked Ohio State Buckeyes rallied in the second half to soundly whip the Indiana Hoosiers on their home field. The game pulled in 87,253 total viewers and 32,071 within the 18-to-49 motherlode. Fox4 ran first at 10 p.m. in total viewers while tying TEGNA8 for the top spot among 25-to-54-year-olds (main advertiser target audience for news programming). Fox4 also notched another pair of 6 a.m. wins and drew the most 25-to-54-year-olds at 5 p.m.
TEGNA8 had the most total viewers at both 5 and 6 p.m., and NBC5 chipped in with a 6 p.m. win in the 25-to-54 demographic.